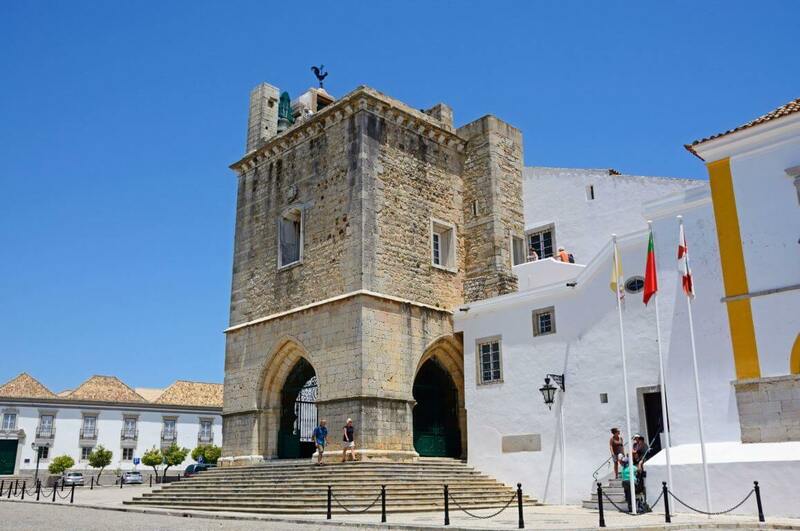 In the old town of Faro you can find the Cathedral of Faro, also known as Sé Catedral de Faro or Igreja da Sé. 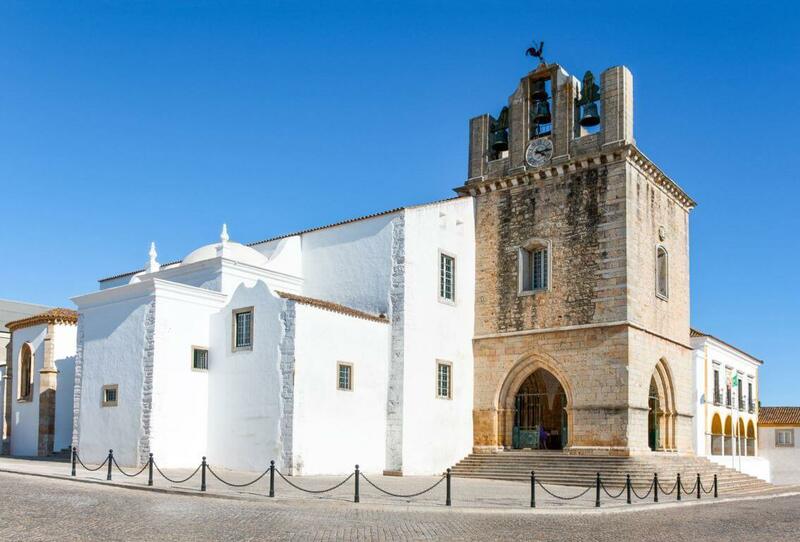 Located next to a square known as Largo da Sé, the Cathedral of Faro is building with a lot of history. In this article you can read all about the cathedral and what to look for during your visit. A visit to the Cathedral of Faro costs € 3,5. From the front of the cathedral you can admire the exterior, including the bell tower on top. Walk to the side to see a different perspective. 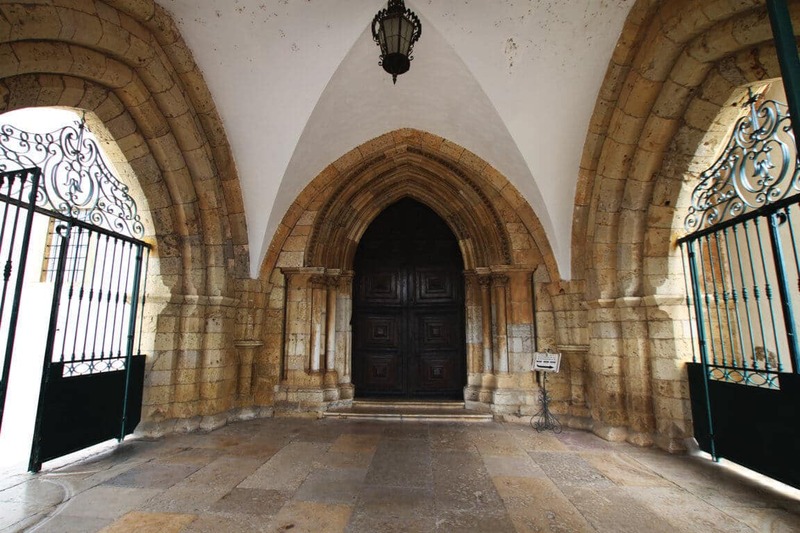 Before entering the cathedral, you can admire the main entrance in pure Gothic style from the 13th century. This entrance consists of an atrium (courtyard) with three large arches which support the tower, and the main portal of the church. This entrance, as well as the tower, has survived earthquakes and invasions and has not been subject to changes. 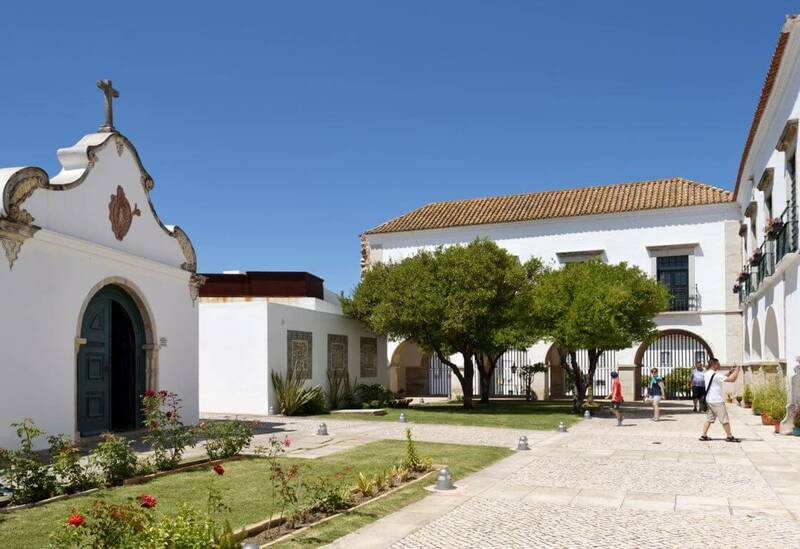 Check out the video below to get a general impression of the Cathedral of Faro. When you arrive, you can enter the courtyard. Basically, the courtyard is a small garden. From here you can enter the Faro Cathedral and see some surrounding chapels. At the outer right end of the courtyard you can find a bones chapel. It is made from human skull and bones. Nearby you can find the chapel of St. Michael. Inside you can find the archangel of Saint Michael, flanked by two angels with torches. The statues are made from wood in the first half of the 18th century. On both sides you can find oil paintings on canvas from the end of the 17th century / beginning of the 18th century. 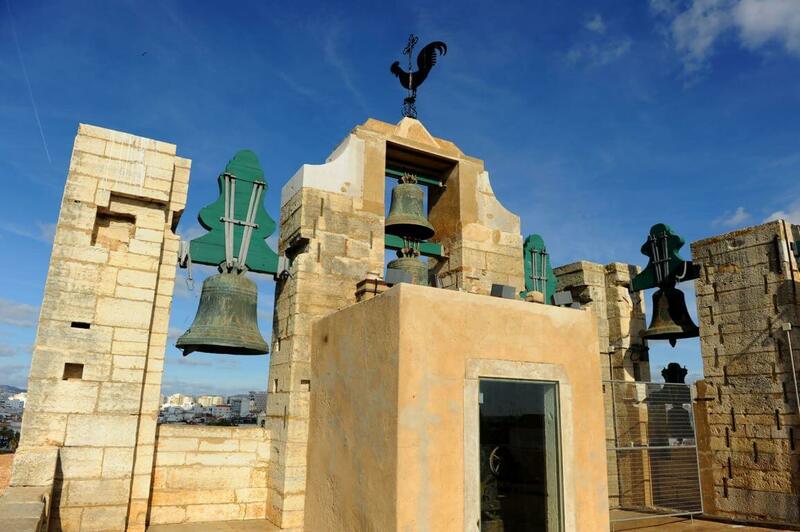 By walking up a narrow staircase, you can reach the bell tower. The staircase has 68 steps. 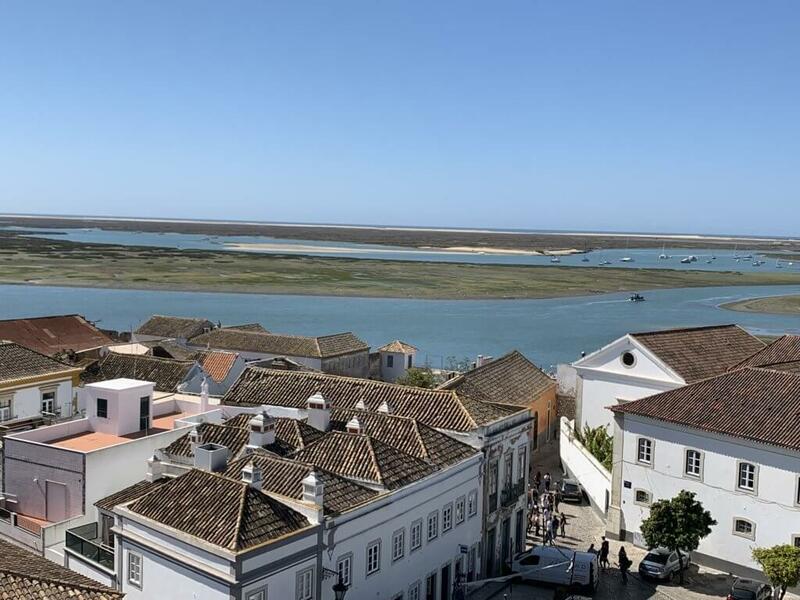 From up here you have an amazing view over the town of Faro and the natural park of Ria Formosa. The interior consists of three naves divided by columns of the Tuscan order. From an architectural point of view, the temple is quite simple. However, the side chapels, the main chapel and the two chapels on the sides of the main chapel show rich decoration. 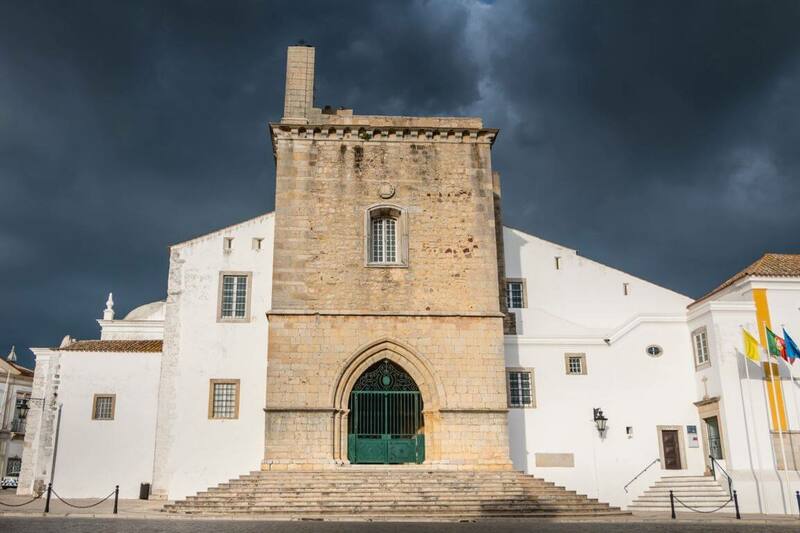 This constitutes one of the finest collections of 17th and 18th-century art in the Algarve. 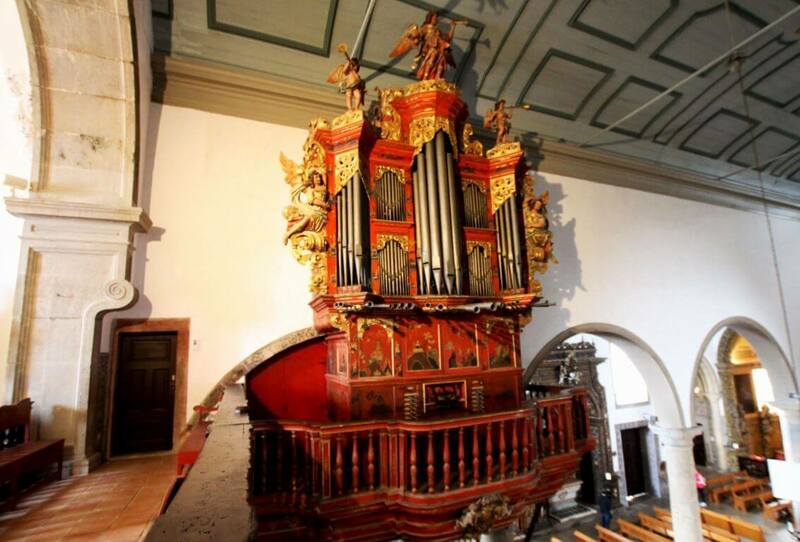 On the left side above the main entrance, there is a beautiful and impressive baroque pipe organ. It comes from the 18th century. You can see that the pipe organ is painted with Chinese motives. The pipe organ is still in perfect condition. On special occasions, it is played during concerts in the cathedral. Starting the visit from the left side of the main entrance, the first chapel is the Chapel of Senhor Jesus dos Pobres (Chapel of Lord Jesus of the Poor). This chapel shows an interesting combination of marble architecture (17th century Renaissance) and golden wood decoration from the Baroque period (1756). 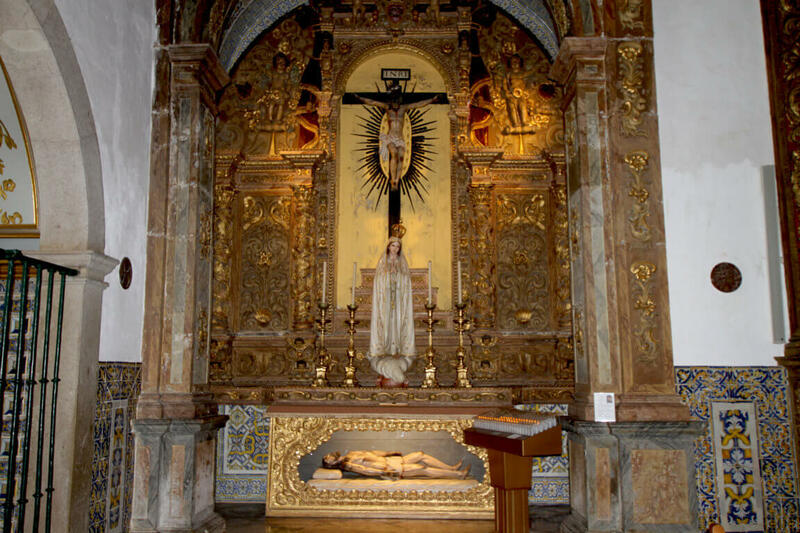 In the middle of the altar of this chapel, there is a wooden representation of the Crucification of Christ from 1756. Underneath in the forefront, there is an image of Our Lady of Fátima, placed here in 1929. Under the altar, there is a representation of Christ after his death. The second chapel is the Chapel of Nossa Senhora do Rosário (Chapel of Our Lady of the Rosary). This chapel was rebuilt in 1690. It presents a rich Baroque altarpiece from 1724 with the statue of Our Lady with the Child. Every chapel should be seen as a whole with the entrance frame. It very often shows the coat of arms of the person who financed its construction. This is also the case in this chapel. 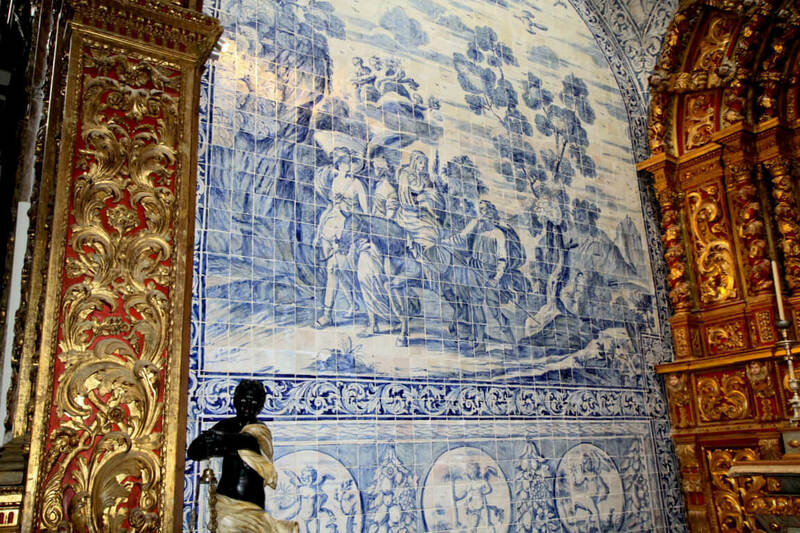 Baroque blue and white glazed tiles on the sides of the chapel represent scenes from the life of Jesus. The tiles on the left side show the Escape to Egypt. The tiles on the right side represent the biblical scene of Jesus as a 12-year old boy. He was at the Temple when his family lost him in Jerusalem and encountered him later among doctors in the Temple. You can also find this story in Lucas 2:42-51. Note the statues of black boys (one on each side of the chapel) holding a candlestick. They recall the Confraternity of Nossa Senhora do Rosário of the Black People, already existing here in 1554. The next chapel is Capela das Almas (Chapel of the Souls). This Baroque chapel from 1722 shows the Crucification of Christ in the centre. Above the arch of the chapel, two angels carry a skull and two human bones, which remind us that the equality before death is independent of social conditions. Then follows the Gothic Chapel from the 13th/14th century. This chapel is dedicated to Nossa Senhora da Conceição (Our Lady of the Conception). The gothic image of Our Lady is from the 15th century. 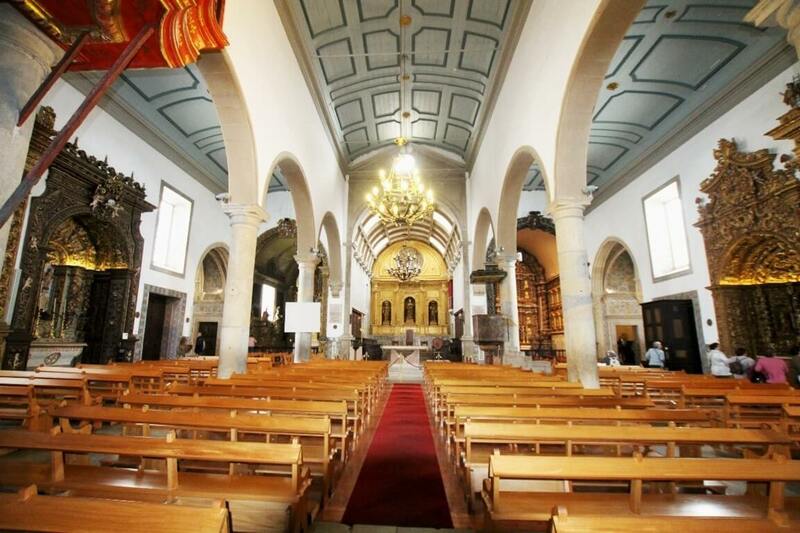 It is from the original church, which was and still is called Igreja de Santa Maria (Church of Saint Mary). 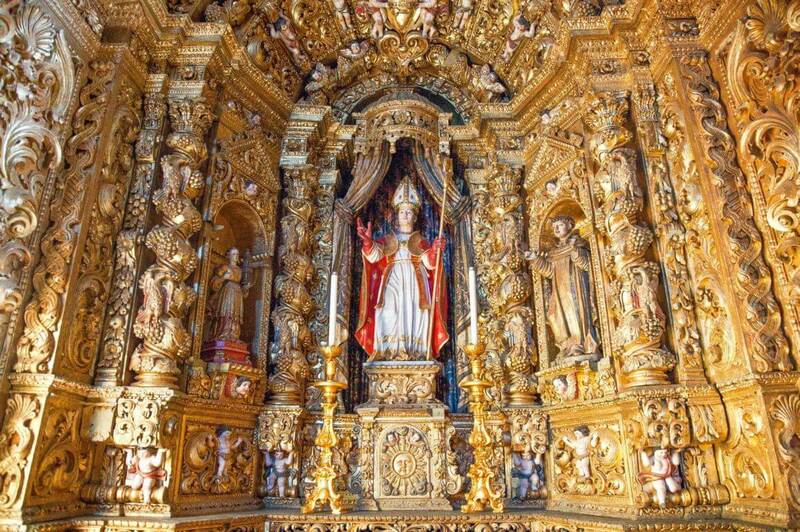 Since early Christian times, the cult of Santa Maria (Saint Mary) was very important in Faro. 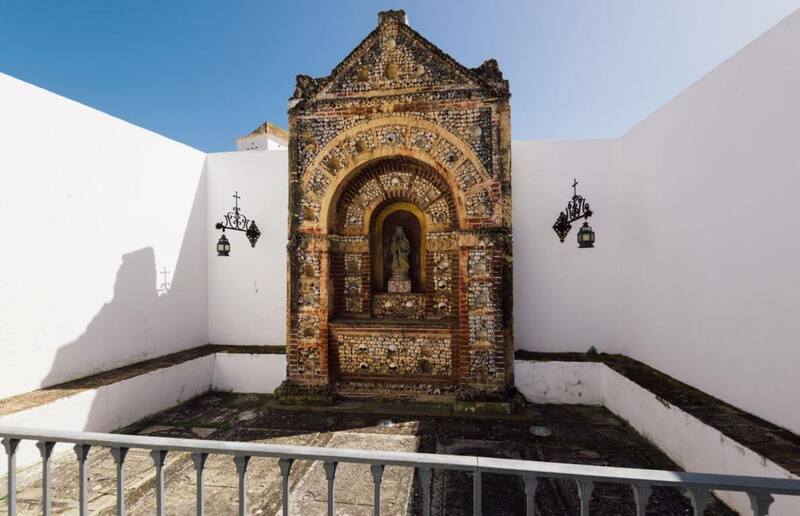 After all, the town was called Santa Maria or XantaMaria (Santa Maria do Garbe during the Moorish period) and dedicated to Our Lady. Besides, this chapel shows an original beautiful gothic vault (13th/14th century) and geometrical glazed tiles from the 17th century. This chapel is the last of the left aisle of the church. 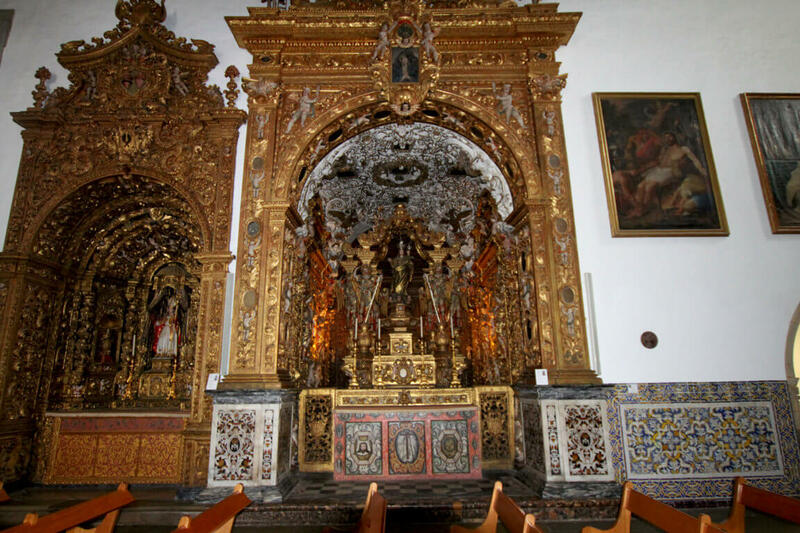 At the end of the left aisle, in an apsis, you can see one of the most remarkable chapels of the cathedral, the Chapel of Santíssimo Sacramento (Chapel of the Holy Sacrament). It is a good example of the transition between Mannerism and Early Baroque. The chapel was totally rebuilt after 1673. 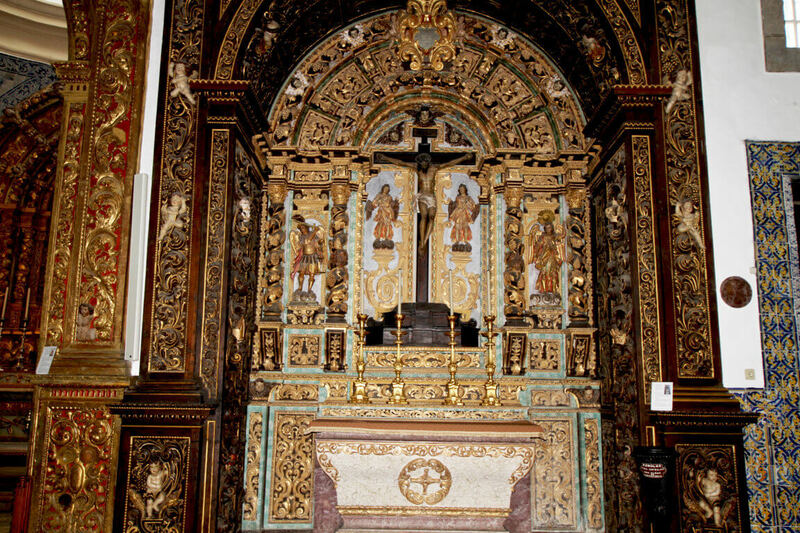 It shows an altarpiece richly decorated with gold and 17th-century paintings on the sides. You can also see wooden statues of the four Evangelists (two on each side). The next chapel is Capela Mor (Main Chapel), located at the end of the nave. This chapel was rebuilt between 1630 and 1640. Besides its Mannerist architecture (late Rennaissance), it shows a beautiful altarpiece in the Mannerist style. 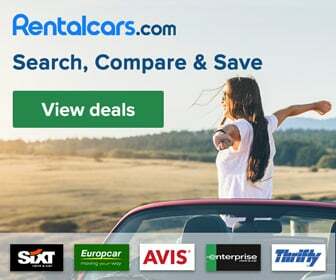 This is the most remarkable in the Algarve. 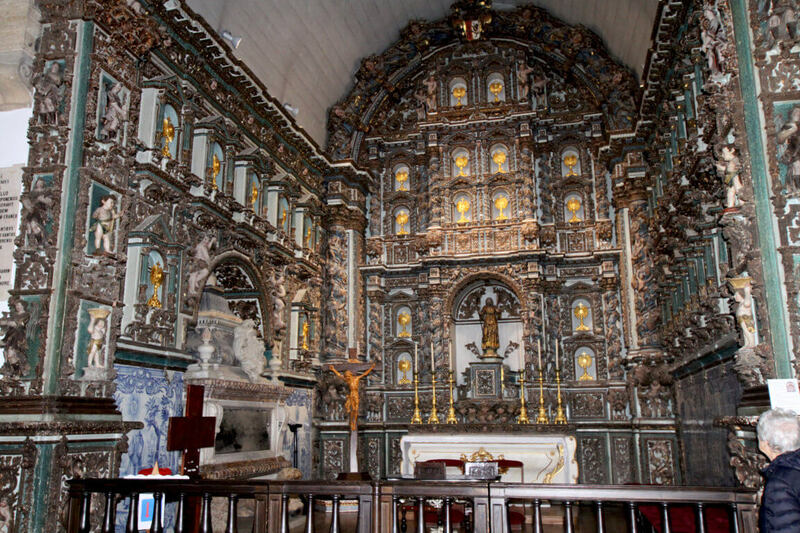 The altarpiece shows an architectural structure totally covered with gold. Furthermore, there are three 16th century statues inside niches: in the middle is Nossa Senhora da Conceição (Our Lady of the Conception) and Saint Peter and Saint Paul on both sides. The painting on the top represents the Coronation of the Virgin. On the sides of the chapel you can see 17th century polychrome glazed tiles. The Choir Stall was concluded in 1704 and is also remarkable. 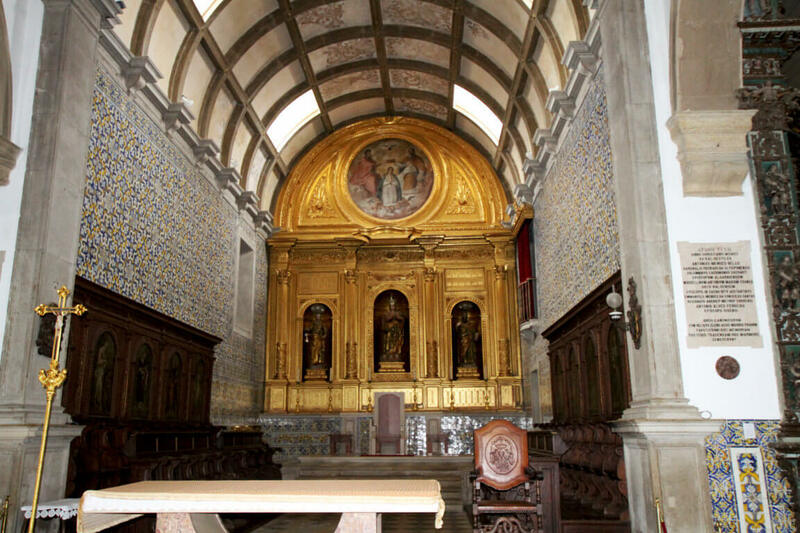 The next chapel is also situated in an apsis on the right side of the Main Chapel and is the Chapel of São Francisco de Paula (Saint Francis of Paola). It is also known as the Relics Chapel. Saint Francis of Paola (1416-1707) was a mendicant friar and the founder of the Catholic Order of Minims. He was canonized in 1519. This is a late 18th-century chapel, completed in 1782. 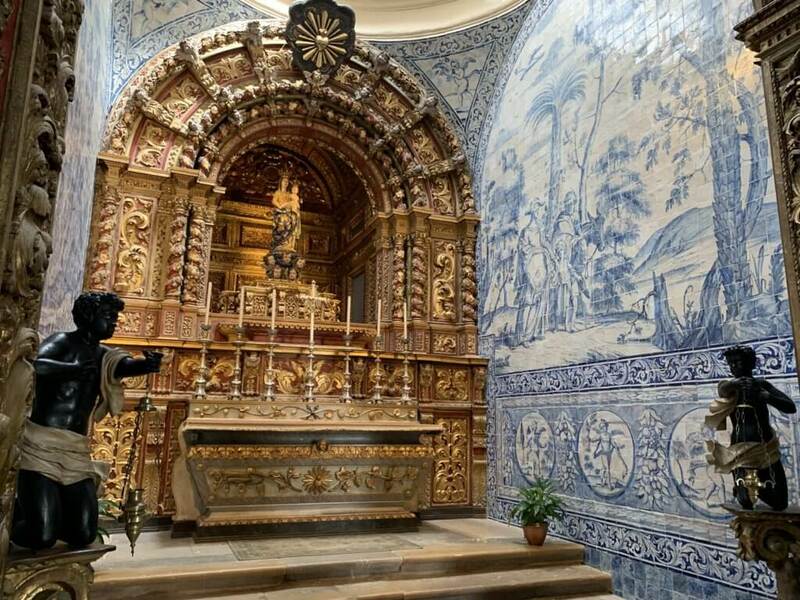 The image on the altar as well as the blue and white glazed tiles represent scenes from the life of the saint. The many niches were intended to receive reliquaries. To the right of this chapel, you will see another Gothic Chapel from the 13th/14th centuries with a tomb of the nobleman Ruy Valente (15th century). 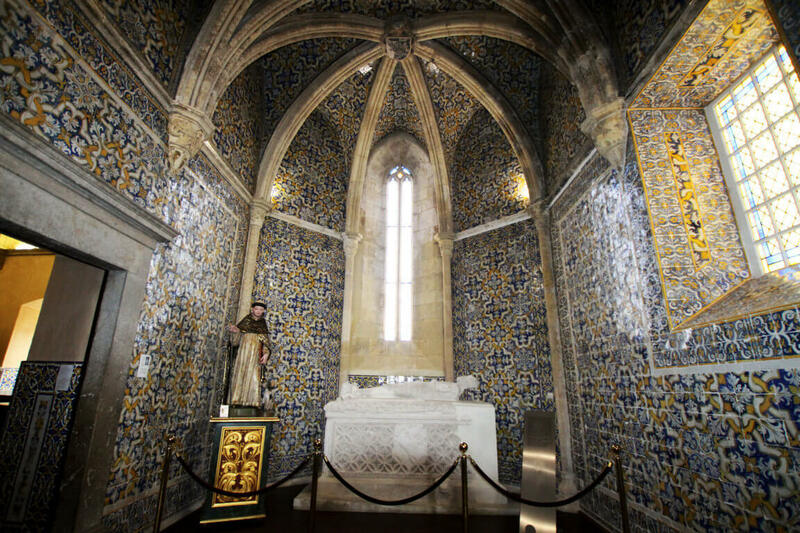 This chapel is dedicated to Saint Domingos, a Portuguese martyr who was killed in 1645 in Brazil during a Dutch invasion. On the left side of the chapel, you can see the 18th-century statue of the saint. This chapel keeps its original Gothic vault and window. You can also see 17th-century polychrome tiles covering the walls. The chapel of Saint Domingos also gives access to the Sacristy, where you can admire a beautiful triptych that evokes the Life and Passion of Christ. It is a remarkable piece of art in the Mannerist style (late Renaissance) from the beginning of the 17th century, which consists of oil paintings on wood. 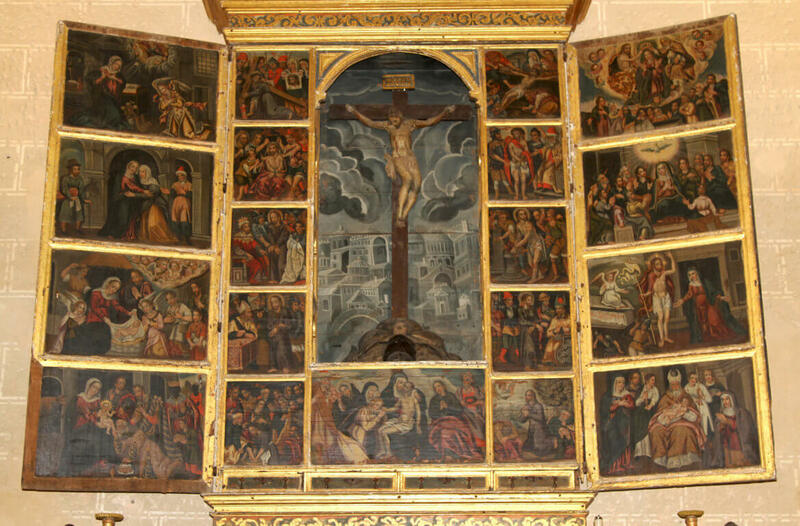 The painting in the middle represents the Crucification of Christ with the city of Jerusalem in the background. 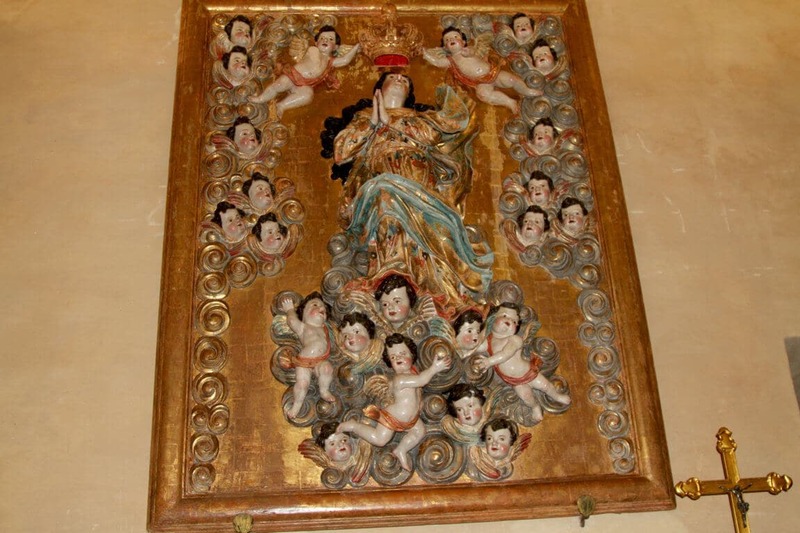 On the opposite side of the Sacristy, there is a high relief of Our Lady of Assumption (18th century). Now going back to the church through the Gothic Chapel you can see the chapels of the right aisle of the church. Next to the Gothic Chapel is the Chapel of São Brás, which shows the statue of this saint on the altar. 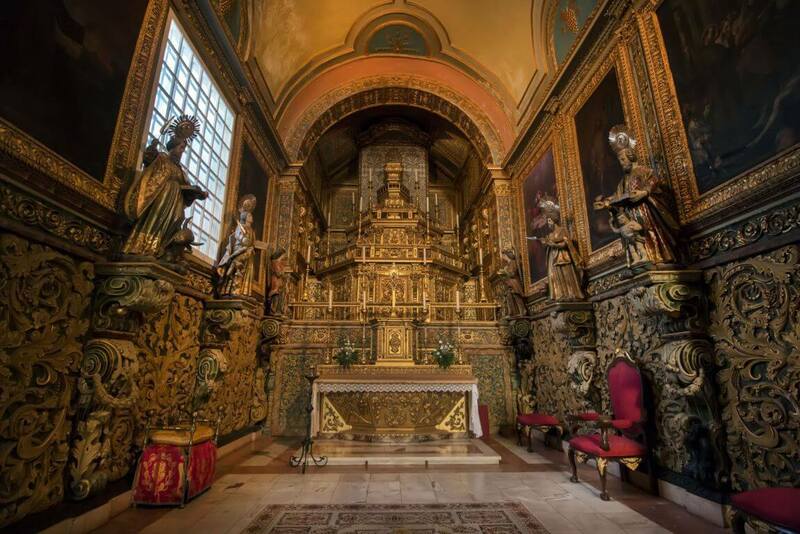 This chapel is from around 1750, from the heyday of the Portuguese Baroque period, due to the huge quantities of gold brought from Brazil. The wood in these altars usually also came from Brazil. The next and last chapel is the Chapel of Nossa Senhora dos Prazeres. 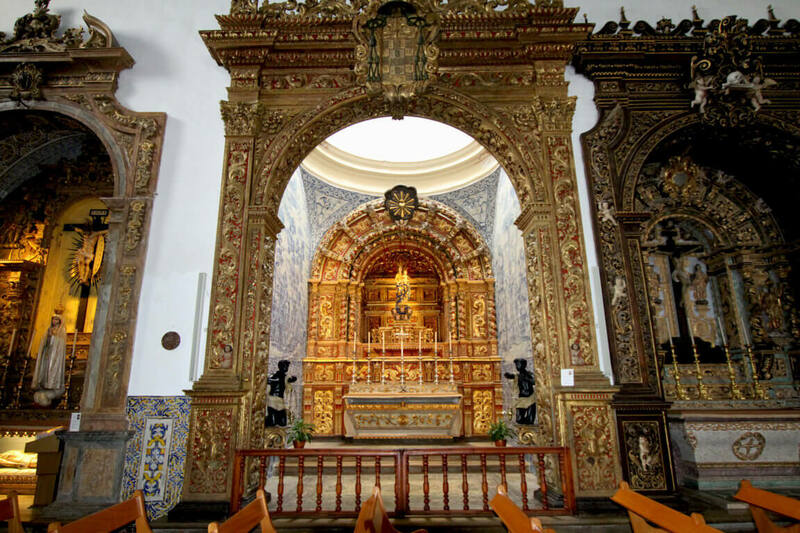 This chapel is a Masterpiece of the Portuguese Baroque in the Algarve. It was finished in 1752. A staircase next to the main entrance leads to an upper floor, from where you have access to the Upper Choir. From here you can see and photograph the beautiful 18th-century Baroque pipe organ and the church. There are also some large Baroque paintings on the sides of the Upper Choir. 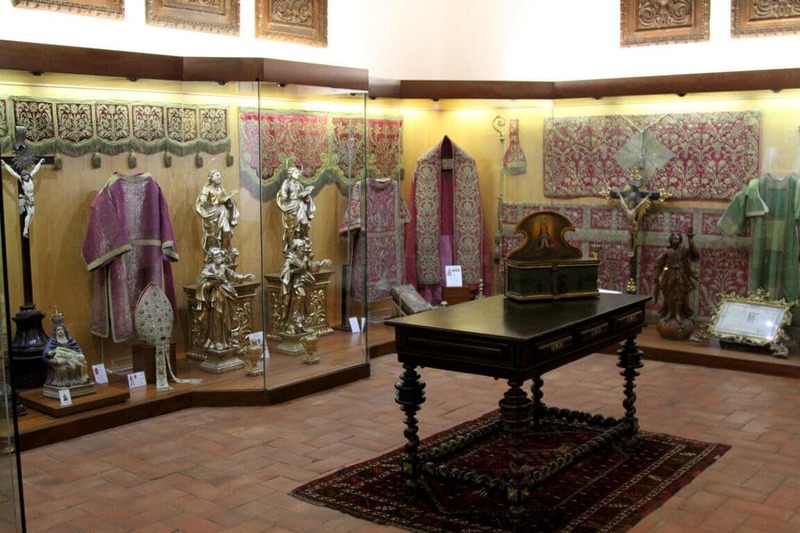 In the first floor, there is the Museum of the Cathedral with several rooms. 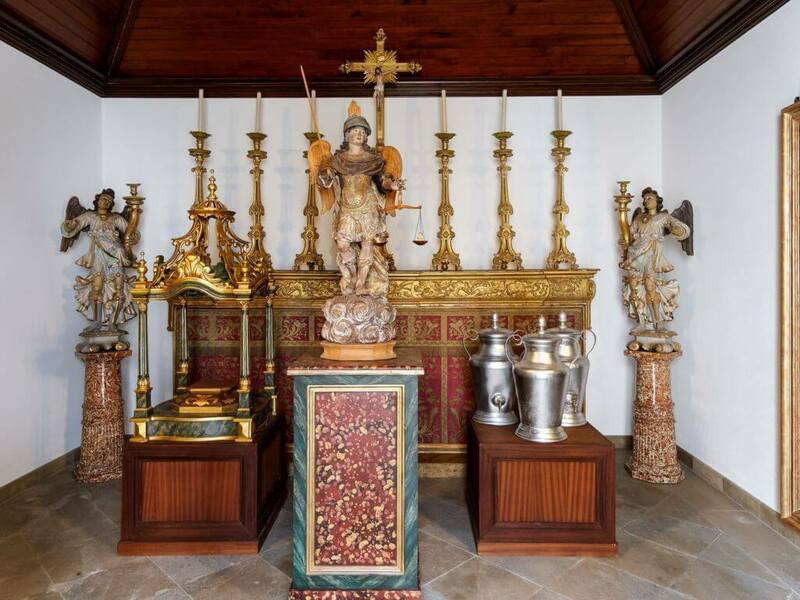 Here you can see liturgical instruments, but also canonicals from different periods and statues. 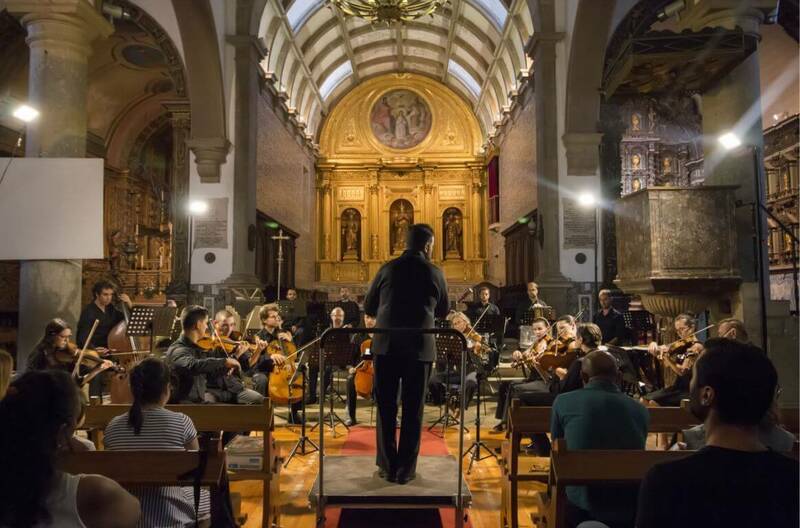 On special occasions, you can enjoy concerts of classical music in the cathedral. 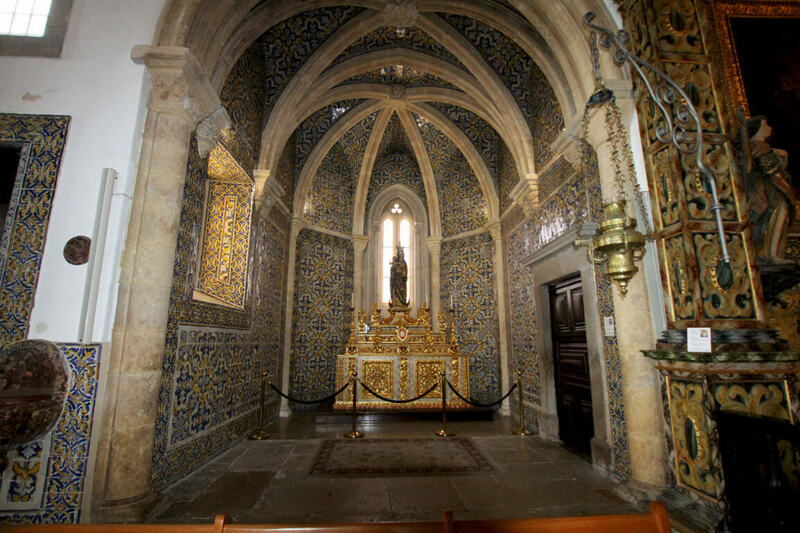 Two years after the Christian conquest of Faro, the building of the main church began in 1251. The original building was devastated a few times by fire and earthquakes. All that remains from the original gothic building is the tower with the main doorway in gothic style, and two chapels in the transept. Major work was required after the English attack led by the Earl of Essex. He sacked and burned the cathedral in 1596. This was a period when Portugal was under Spanish rule. Major work was also required after the earthquakes of 1722 and 1755. After several changes in its architecture and decoration, the present building presents a mixture of styles. There are gothic, renaissance and baroque influences. Thus the Cathedral of Faro is well worth a visit.